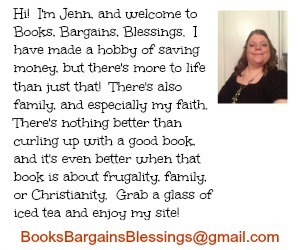 Books, Bargains, Blessings: Is it better to save money or earn extra Cash? Is it better to save money or earn extra Cash? 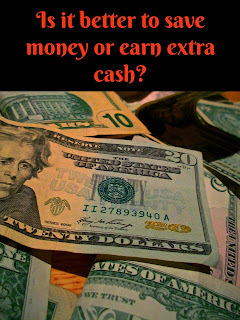 I sometimes get asked the question if it is better to save money or to earn extra cash. Well, honestly the answer is BOTH. The key to being financially independent is to make all you can and save all you can. But when it boils down to it, I say things like using coupons, when looking at dollar per dollar amount is more benefial. Here's why: You don't have to treat it as income. It's not taxable. Say you save $1,000 in the same amount of time it would take you to earn an extra $1,000. All things are equal (providing that savings is on things you truly need.) You don't have to pay state or federal income tax on that. If you would WIN that $1,000 in a contest (you can see all my posts here about winning contests and sweepstakes) you would still have to pay income tax just as if you earned it. I figured out that for my couponing to no longer be cost efficient for the effort I put into it, I would need to make about $100,000 a year. Of course, since it's something I enjoy and I love the word "free" it's something I would do even if I was a millionaire. I remember once I was playing a game and the question came up who in the group would be most likely to still use coupons if they won the lottery. EVERY. SINGLE. PERSON. voted for me. My friends know me well. Of course saving AND earning is better, but if you can only do one, I recommend saving because it usually gives you more time with family!